Spider-Man. 2010. Watercolor on paper, 9 × 12″. 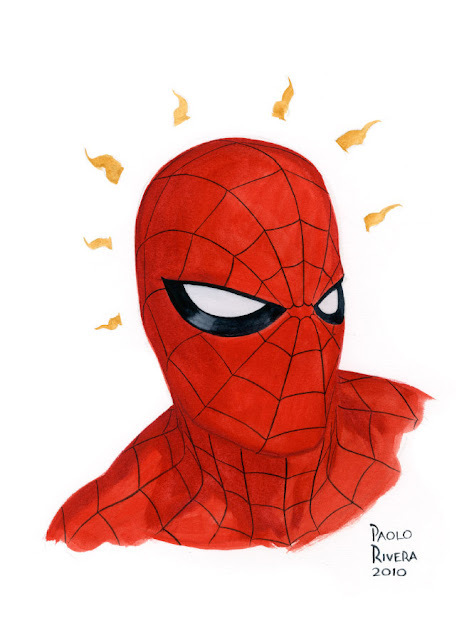 Spidey senses an announcement coming on Wednesday — news so big that we might just have to skip Wacky Reference Wednesday this week. So excited! You are a horrible tease. All will be revealed tomorrow. Is the secret that it's your birthday on 3/16? Today? If so, happy cakes! If not, happy cakes! Okay, so I was wrong about today... but I've certainly heard some rumors. As for happy cakes, 'tis indeed. Man, i love how u paint ol webhead! This is sweet brother.